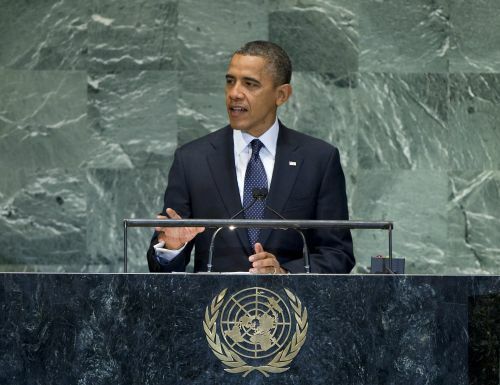 UNITED NATIONS, Sep 25 2012 (IPS) - Addressing the 67th General Assembly at the United Nations in New York Tuesday, U.S. President Barack Obama accused the Iranian government of propping up the dictatorship in Syria and supporting terrorist groups abroad. He charged that Tehran has failed to demonstrate the peaceful intentions of its nuclear programme to the United Nations, and warned that time for a diplomatic solution was “not unlimited”. He described the video as “crude and disgusting” but defended the right to free speech. He also said that the video, no matter how offensive, does not justify acts of violence. “There are no words that excuse the killing of innocents. There is no video that justifies an attack on an embassy,” he said. Obama promised a firm response to the killings and to be “relentless in tracking down the killers and bringing them to justice”. He also acknowledged Egypt, Tunisia and Yemen for helping to secure U.S. facilities following the attacks. In the context of the attacks, Obama called for all leaders in all countries to speak out against violence and extremism. “It is time to marginalise those who… use hatred of America, or the West, or Israel as a central principle of politics,” he asserted. Still speaking on relations in the region, Obama called for a secure, Jewish state of Israel and an independent Palestine, as well as an end to the Assad regime. “As we meet here, we again declare that the regime of Bashar al-Assad must come to an end so that the suffering of the Syrian people can stop, and a new dawn can begin,” he said. Throughout his address he encouraged unity, tolerance and understanding between Western and Eastern countries and cultures. “We have taken these positions because we believe that freedom and self-determination are not unique to one culture. These are not simply American values or Western values – they are universal values,” Obama said. Secretary-General Ban Ki-Moon told the assembly that the Syrian crisis is no longer confined to the country itself but has become “a regional calamity with global ramifications”, and called for Security Council action. He placed responsibility on the international community to find a Syrian-led resolution to the situation as well as to support humanitarian aid efforts in the country. Ban also called for a peaceful solution between Palestine and Israel, saying that a two-state solution was the only sustainable option, but warned that “the door may be closing for good”. He expressed his concern over the continued growth of Israeli settlements in the occupied Palestinian territory in that it was seriously undermining peace efforts. He strongly rejected potential military action by one state against another. Ban also spoke about the need for nuclear weapons to be controlled, and said that “Iran must prove the solely peaceful intent of its (nuclear) programme.” He also encouraged the Democratic People’s Republic of Korea to move towards the de-nuclearisation of the Korean peninsula. Sustainable development formed a crucial part of Ban’s address, a path that is “the key to our hopes for the future” and “my top priority as secretary-general”. He called on states to honour their promises to reach a legally binding agreement on climate change by 2015. “Sustainability and the green economy offer compelling opportunities to promote jobs, growth, innovation and long-term stability,” he said. He also called for greater attention and support for the humanitarian crisis in Africa’s Sahel region, where some 18 million people face food insecurityand one million children under five are at risk of starvation. “The international community needs a major concerted effort to address this alarming situation,” Ban said. The secretary-general also voiced concern over volatile food markets, saying that “governments must not impose trade restrictions on grains or other agricultural products” in order to maximise food supplies. During his opening address of the General Debate, the new president of the General Assembly, Vuk Jeremić, spoke of the need to attend to the increasing volatility and unpredictability of the global environment. “We are beset by a series of ruptures that seem to be building in intensity. Their effects can barely be kept in check,” he said. Jeremić highlighted three variables in the global environment that must be attended to. He spoke first of states aspiring to take on more significant roles and exercise a greater level of influence in their region. “Virtually no one’s position is the same today as it was just a generation ago, making it more difficult for a meaningful and enduring consensus to be reached on significant items on our shared agenda,” he noted. The second issue he noted as the increasing access of “capabilities” to non-state actors, such as the ability to inflict harm on a massive scale, and the concerns this raises for member states. The theme for this year’s debate, as chosen by the Assembly’s president, is “adjustment or settlement of international disputes or situations by peaceful means”. “Rarely has it been more necessary for the world to draw closer together. It is to this endeavour that I believe we should devote the full scope of our resources,” Jeremić said. To Obama Syria is a dictatorship.Insulting Prophet is free speech.He wants us to believe this theory.He thinks peoples are fools.